First off let me sincerely apologize for my lack of writing lately. I have been extremely busy with exams but I am back and hopefully will not have any interruptions for awhile. Thank you for your patience. This episode begins with a recap of the ending of the last episode where Jan Di walks back into the party. Ji Hoo gives his hand to Jan Di asking her to dance. At first she is hesitant but then she shyly agrees. Jun Pyo is not happy that he asked her to dance first. Back inside the party, Ji Hoo and Min Seo Hyun are dancing while Jan Di is sitting and watching. She can no longer watch them so she gets up to leave the party as well. Jun Pyo is sitting by the pool and he spots what looks like a cricket on a chair. it jumps on his head and he goes crazy trying to get it off. (Ok so we now really know that he is afraid of any bugs...I feel your pain Jun Pyo!) While he is thrashing around trying to get if off of him, he falls into the pool. Jan Di at that moment is walking down the stairs and hears a splash. She thinks nothing of it until she hears someone screaming for help. Someone runs back to the party to alert everyone that Jun Pyo has fallen into the pool. Everyone runs. The mean girls do not understand but Ji Yung tells them that the great Jun Pyo can not swim. When they reach him, Jan Di has already pulled Jun Pyo from the pool and is attempting CPR. (why has no one called for an ambulance? Everyone is just standing there!) 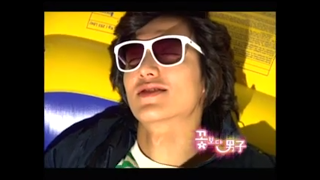 Jan Di starts giving Jun Pyo mouth to mouth resuscitation. After a few tries Jun Pyo's eyes pop open! He tries to pull Jan Di in for a kiss but she starts pulling away and screaming (she is nuts! haha) He quickly sits up with a big smile on his face. It doesn't last long because Jan Di punches him in the face!! Now we see why he was up early and in such a great mood. He was planning more things for Jan Di. She goes to open the door to the pool and the handle is covered in some sort of clear gel like stuff. When she finally gets to the pool, it is filled with ducks!! Jun Pyo is watching from his "clubhouse" and laughing as he sees Jan Di go into a rage. Before Jan Di leaves she opens her umbrella and places it over the violin to protect it from the snow. He hears footsteps and thinks it is Jan Di when actually it is the mean girls coming to show him the video of Ji Hoo and Jun Pyo together. The look on Jun Pyo's face tells the girls that he is mad although we know it is because he is upset and hurt. When the girls bad mouth Jan Di, he tells them to shut up and breaks the camera. Jan Di runs back to the "magical forest" in hopes to find Ji Hoo. He is not there. When she turns around she is confronted by Jun Pyo. She tries to walk away but he grabs her arm. After talking for a few minutes, Jun Pyo once again tries to kiss Jan Di. She starts screaming and pulling away again. (I seriously need to have a talk with this girl!) He lets her go, asks her if she really hates him that much and walks off. Jan Di receives an invitation to Min Seo Hyun's birthday party. her parents are excited and go down to the Dry Cleaners (that they own) to look for a dress for her to wear. They are upset that they can not give Jan Di a suitable dress. A woman arrives with a package for Jan Di from Min Seo Hyun. Inside is a dress for her to wear to the party. Jan Di arrives at the party and gathers with the members of the F4 minus Ji Hoo. Ji Yung and Woo Bin talk about how well Jan Di looks but Jun Pyo puts her down. Ji Hoo and Min Seo Hyun come out to greet the guests. Ji Hoo plays "Happy Birthday" to Min Seo Hyun on his violin while her giant birthday cake is set in front of her. Ji Hoo leaves the room and Min Seo Hyun tells everyone that she is leaving Korea to go to Paris and she will not be returning. Min Seo Hyun finds Ji Hoo in a room playing with a puppet she gave him a long time ago. He gets mad and throws it and tells her that he feels like he is being thrown away also. She tries to tell him that he has feelings for Jan Di but he does not want to hear it. he rushes to her and tells her he wants to be with her. She hugs him and afterwards they share a kiss. Jan Di is standing at the door and witnesses the kiss. She quietly closes the door and steps away. Jun Pyo finds her outside of the door and teases her. Ji Hoo and Min Seo Hyun come out and tells them they are going for a drive and ask if she wants to come along. Jun Pyo saves Jan Di by telling them they were going for a drive as well. Jun Pyo takes Jan Di to a bar that he rented for the night. He tells her that she is the only girl he has ever approved of. Both of them get flustered and Jun Pyo gets up to go to the restroom while Jan Di downs some alcohol. When he returns, Jan Di is drunk and starts saying all kinds of crazy things. She goes to tell him that the only way to repay him for everything is kiss him but she ends up throwing up on him instead. Jun Pyo takes Jan Di to his house for the night. Shortly after she wakes up, the steward comes to alert Jun Pyo that the witch (Jun Pyo's mother) has arrived. Jun Pyo calls in the other members of the F4 to help him out. They dress Jan Di up and tell the witch that she is a friend from school. She is very skeptical of the girl. They are holding a yearly auction at the house and the witch reminds everyone that they are to take part in it. During the auction Jan Di sees a pair of swimming goggles that belonged to a famous Olympic swimmer. Jun Pyo sees that Jan Di really likes them and secretly bids on them. He gives them to her before she leaves. When she gets home she puts the goggles in the place that she once had Ji Hoo's handkerchief in. Everyone is realizing that Ji Hoo is depressed. 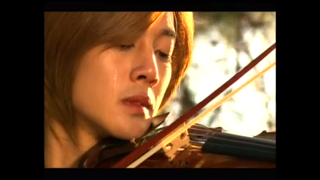 Jan Di goes looking for him where she first met him and then finds him in the "magical forest" playing the violin and crying. Jan Di goes to the pool where she finds Min Seo Hyun. She came to tell her goodbye. Ji Hoo sees Min Seo Hyun's car outside of the pool house and finds the two talking. Jan Di gets on her knees and begs her not to leave, saying that if she goes Ji Hoo may never smile again. Ji Hoo listens secretly behind a wall. In the middle of Jan Di pleading Min Seo Hyun to stay, he turns around and leaves. Min Seo Hyun picks Jan Di up and tells her why she must leave and asks her to make Ji Hoo smile again. She then gives Jan Di a pair of shoes. As Jan Di is walking home she is confronted by Ji Hoo who is mad because of what Jan Di has done. Jan Di tries to tell him why she did it but Ji Hoo does not care and tells Jan Di to get lost. Is it me or is Jun Pyo just a grade school kid in a man's body? He picks on Jan Di and is mean to her because he likes her. That is so elementary! What is crazy is that it seems to work no matter what age they are. You can tell by the look on Jan Di's face after she puts the goggles away that she could possibly like Jun Pyo. I am kind of upset that Min Seo Hyun is leaving. I am not sure what they would have done with her but she only got to play a small part in this drama. I hope you are enjoying this BLAST FROM THE KDRAMA PAST! Thanks for reading!